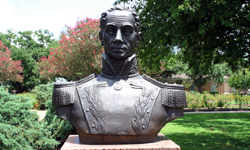 As befits the liberator of South America, the bronze bust of Simon Bolivar stands on a granite pedestal. It was created by sculptor C. Talacca in 1977 and was dedicated in December of 1978. 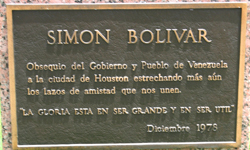 Simon Bolivar was a wealthy Venezuelan who was caught up in the South American liberation movement of the early Nineteenth Century. He is considered the foremost military and historical hero of the continent, having led the war for independence from Spain, and served as president of Venezuela, Gran Colombia, Bolivia (which was named for him) and Peru.